Conservative kidney management is increasingly accepted as an appropriate treatment option for patients with eGFR category 5 CKD who are unlikely to benefit from dialysis and/or who choose a nondialysis care option. However, there remains great variation in the delivery of their care. As part of the development of a conservative kidney management pathway that is undergoing evaluation, a set of recommendations specific to conservative kidney management for managing the complications of CKD and common symptoms was developed. These recommendations focus on the patient’s values and preferences and aim to optimize comfort and quality of life. Explanations for the interventions are provided to support the shared decision-making process between health care professionals, patients, and family members. The recommendations generally emphasize the preservation of function (cognitive, physical, and kidney) and address symptom burden, acknowledging that management priorities can change over time. The recommendations should be used in conjunction with other key elements of conservative kidney management, including clear communication and shared decision making for choosing conservative kidney management, advance care planning, and psychosocial support. Although there are limitations to the existing evidence specific to conservative kidney management, these recommendations are intended as a starting point toward reaching consensus and generating further evidence. Conservative kidney management is a treatment option for patients with eGFR category 5 CKD who, through shared decision making and holistic patient-centered care, emphasizes quality of life (QOL), active symptom management, and advance care planning. It includes interventions to delay the progression of kidney disease, but it does not include dialysis (1). Although conservative kidney management is increasingly recognized as an appropriate treatment option for patients who are unlikely to benefit from dialysis and/or who choose a nondialysis care option, there is still great variation in how this care is conceptualized and delivered (2). 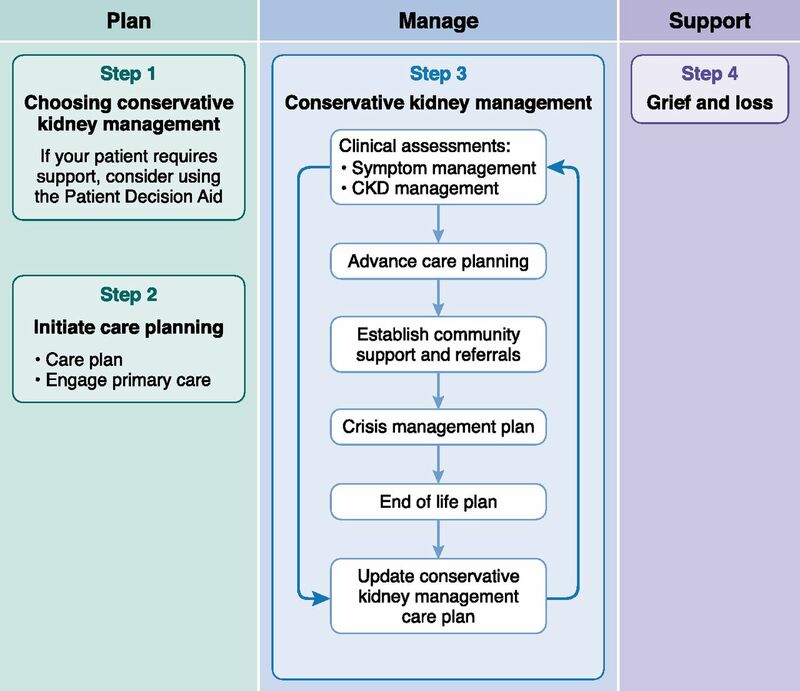 As part of a 3-year plan to develop, implement, and evaluate an interactive conservative kidney management pathway across Alberta, Canada (3), stakeholders and end users, including patients and family, identified the need to include recommendations for managing (1) the complications of CKD and (2) symptoms that were specific to conservative kidney management. Although guidelines exist for CKD management in general and some guidance is available for symptom management for patients with advanced CKD, there are no clear guidelines or recommendations for the care of patients who choose conservative kidney management. The Conservative Kidney Management Pathway (3) is a web-based tool that consists of two main components: (1) an interactive Patient Decision Aid to support shared decision making around dialysis versus conservative kidney management and (2) integrated care plans designed to be individualized. The recommendations on the management of CKD complications and common symptoms are just one part of these care plans (Figure 1). Other key elements include advance care planning and goals of care, establishing community support and appropriate referrals, preparing for crises and the end of life, and grief and loss. The purpose of this article is to describe the development of the conservative kidney management–specific recommendations for both CKD management and symptom control. It should be noted that these recommendations represent expert opinion backed by evidence where it exists. However, evidence is currently insufficient to undergo a rigorous clinical guideline development process. The key principles that were used to guide the development of the recommendations and the conservative kidney management pathway as a whole are outlined in Supplemental Table 1. The recommendations were written for the wide variety of health care professionals (e.g., family physicians, home care nurses, pharmacists, and dieticians) who provide care for these patients. They will be updated as further evidence emerges in the best practices of care for these vulnerable patients. Key components of the Conservative Kidney Management Pathway. Reprinted from the Kidney Supportive Care Research Group (3), with permission. In June 2015, stakeholders from various disciplines and areas of specialty formed a Conservative Kidney Management Clinical Working Group under the leadership of the Kidney Supportive Care Research Group (KSCRG) (4) and Alberta’s provincial Conservative Kidney Management Steering Committee. The steering committee was responsible for ensuring a high level of engagement of health care providers, patients, and family throughout the province with respect to the delivery of quality conservative kidney management. These patients tend to be older with multimorbidity, including a high prevalence of geriatric syndromes, such as frailty, and they have high annual mortality rates. The recommendations, therefore, needed to incorporate geriatrics and palliative care approaches. To reflect this, the working group consisted of professionals from nephrology, palliative care, primary care, and geriatric medicine, and it represented the disciplines of pharmacy, dietetics, nursing, medicine, and social work. These disciplines are representative of the team members typically involved in the care of patients with ESKD being managed conservatively without dialysis. They each have important roles in managing the complications of CKD and optimizing symptom management and QOL, and they offered important perspectives. There are few studies specific to the care of patients choosing conservative kidney management. The recommendations presented here were developed using both existing evidence and expert opinion from nephrology, geriatric medicine, and palliative care. We searched the literature for guidelines on conservative kidney management and evidence on each of the specific topics described in Tables 1 and 2. Electronic databases searched included MEDLINE, CINAHL, UptoDate, the Cochrane Library, and Dynamed. Search terms included conservative kidney management, supportive kidney care, supportive kidney management, ESKD, guidelines, and recommendations. These terms were then used in searches for each specific CKD and symptom management topic. Results also incorporated prior literature searches that had been done for the Kidney Disease Improving Global Outcomes (KDIGO) Controversies Conference (1). Using the Johns Hopkins Nursing Evidence-Based Practice Rating Scale (5), three of the authors (S.N.D., B.T., and B.A.W.) considered the search results and prioritized them for inclusion depending on the strength of evidence. Searches of the literature as well as Micromedex, Lexicomp, and RxTx were also done for appropriate dosing, available dosage forms, and approved indications (versus off-label uses) of drugs, which were included throughout the recommendations. Guidelines for the management of CKD, such as those developed by KDIGO, were considered to be evidence based and best practice. We adapted existing provincial guidelines that are aligned with KDIGO recommendations with two primary objectives: (1) to make them more appropriate for patients undergoing conservative kidney management and (2) to make them more accessible to the health care professionals caring for these patients outside of nephrology. No comprehensive symptom management guidelines specific for conservative kidney management were identified. Current symptom algorithms proposed for patients on dialysis may not always be appropriate for those with category 5 CKD managed without dialysis. There are, however, examples of end of life (terminal care) algorithms for patients with advanced CKD, regardless of dialysis management (6,7). The KSCRG wrote the initial drafts of the recommendations. Working group meetings were used to discuss all areas of uncertainty and reach consensus. After consensus, all recommendations were circulated to a wider audience of relevant stakeholders, which included practitioners in nephrology continuing care (including home care, long-term care, and assisted living), primary care, acute care, and emergency services and also involved nurse practitioners, respiratory therapy, and spiritual care. The illness trajectory of patients being cared for conservatively can be highly variable, and the patient’s eGFR does not necessarily predict the overall clinical picture. A patient with an eGFR of 15–10 ml/min per 1.73 m2 or indeed, even lower may remain functional and stable for years, although some may deteriorate over a few months (8). A patient who has an eGFR of 5 ml/min per 1.73 m2 typically has a life expectancy measured in weeks to short months. Comprehensive conservative kidney management recommendations, although focused predominantly on the patient’s goals of care and preferences, should also take into account the patient’s general condition and prognosis, because these may be important factors for patients in the shared decision-making process (Figure 2). Earlier in the disease trajectory, maximizing QOL likely requires a careful balance between preserving function and addressing symptom burden, whereas control of symptoms and comfort generally take precedence in the last weeks and days of life. Clinical condition is incorporated into the conservative kidney management recommendations. The recommendations for managing the complications of CKD are summarized in Table 1. The full recommendations are available freely online and provide more specific information on dosing (3). The approach to CKD management in this population represents a shift from disease-focused treatment to symptom- and patient-specific, goal-focused interventions. Medications are used with the intention of improving symptoms and protecting kidney function, but the latter is only if it will also enhance QOL and/or help a patient achieve his or her goals. Three examples will be discussed in more detail, but the principles extend to the other recommendations. Although optimal BP control is important in slowing the progression of CKD, this is likely not the focus of care for most patients undergoing conservative kidney management who tend to be frail. Rather, the aim of BP management for these patients is to optimize QOL, preserve physical and cognitive function, and minimize the risk of orthostatic hypotension and falls. For these reasons, we recommend relaxing BP targets for most patients who are being conservatively managed, reflecting these priorities of QOL and safety over CKD progression. The geriatric literature suggests that a target systolic BP of 160–190 mm Hg is reasonable for frail patients near the end of life (9). Our recommendations have identified the lower end of this target as being appropriate for conservative kidney management. There is no evidence that statins provide benefit in the context of significant frailty or decreased life expectancy (9,10). A randomized trial of discontinuing statin therapy in patients with life-limiting illness suggested that cessation was not only safe but that it improved QOL (10). Statin therapy is an example of an intervention that takes years to accrue benefits. Advanced age and multimorbidity are risk factors for adverse effects of statins, which can include myopathy and a potential link to cognitive deficits. Therefore, we feel that it is appropriate to discontinue statins for patients undergoing conservative kidney management (11). Current CKD guidelines aim to normalize serum calcium, phosphate, and parathyroid hormone levels to prevent bone abnormalities and vascular calcification. However, it is not clear that there are benefits to normalizing these factors in patients being cared for conservatively in the last years of life. Rather, there is the possibility of harm in promoting lower protein intake in patients already at high risk for protein malnutrition (12). Instead, the focus is on promoting QOL. This includes maintaining adequate nutrition, avoiding malnutrition and inflammation, and liberalizing the diet. In addition, serum phosphorous, calcium, or parathyroid hormone levels do not seem to be major drivers behind uremic pruritus (13). For these reasons, we recommend not focusing on normalizing biochemistry but rather, emphasizing adequate nutrition. There does seem to be an association between low albumin and pruritus severity, suggesting an association between pruritus and malnutrition-inflammation complex syndrome and reinforcing the need for adequate nutrition (14). Parathyroid hormone levels do not affect decision making within this conservative approach to care; therefore, there is no need to monitor. For all of the recommendations in Table 1, the intent is to ensure that interventions are aimed at optimizing QOL and providing comfort, which is in alignment with the patient’s preferences. Recommendations for the management of symptoms for patients on a conservative kidney management pathway are summarized in Table 2. All recommendations follow a similar approach. The first step is to assess the patient and rule out contributing reversible factors. The second step is to consider nonpharmacologic interventions. The third step is to use pharmacologic interventions. The aim of treatment is to ameliorate symptoms that are adversely affecting the patient’s QOL, because it is not always necessary or possible to resolve them completely. Patients under-report symptoms unless they are assessed explicitly (15). Therefore, in alignment with KDIGO recommendations (1), we recommend routine screening at each consultation for physical and emotional symptoms using a validated tool, like the Edmonton Symptom Assessment System Revised: Renal (16) or the Integrated Palliative Care Outcome Scale Renal (17). The pain recommendations also suggest using a validated pain assessment tool, such as the Brief Pain Inventory, to help categorize and classify the pain and to assess response to management (18). For all recommendations, dose adjustments and side effects are mentioned, and off-label uses are noted. The pathophysiology of uremic pruritus is not fully understood, and multiple complex mechanisms likely play a role. Uremic neuropathy (19), skin or nerve inflammation in the context of chronic systemic inflammation (20), and an increase in activity of μ-opioid receptors have all been implicated (21,22). A recent systematic review found low-dose gabapentin or pregabalin to be effective for uremic pruritus; however, evidence for other interventions remains weak (23). The precise pathogenic mechanisms responsible for uremic restless legs syndrome (RLS) are unknown. The most widely accepted hypotheses for idiopathic RLS are dysfunction of the dopaminergic system, iron deficiency, and anemia (24,25). It is felt that these mechanisms may play a role in uremic RLS (26). The associations between RLS and iron deficiency and anemia are inconsistent in patients on hemodialysis, perhaps due to regular treatment with erythropoietin and iron. However, it may be beneficial to address these abnormalities in patients who are conservatively cared for to determine if they receive symptom relief. High serum phosphorus levels have also been independently associated with the presence of RLS in patients on hemodialysis (26). First-line treatment for idiopathic RLS is dopamine agonists. Dopamine agonists have shown benefit in patients on hemodialysis, but their use seems to be associated with decreased response compared with that in patients with idiopathic RLS (27). Subclinical peripheral nerve abnormalities have been implicated in RLS (28). In ESKD, gabapentin was associated with reduced RLS compared with placebo and the dopamine agonist levodopa. Because of a short duration of action, rebound, and augmentation with levodopa treatment as well as adverse effects of severe vomiting, headaches, dry mouth, and gastrointestinal symptoms, our recommendations suggest gabapentin as first-line treatment for uremic RLS (29). Although benzodiazepines are not recommended for RLS in patients undergoing conservative kidney management due to the limited evidence for their use and the significant risks of falls, fractures, and decreased cognition, they may be the only option for a patient who can no longer swallow. This is reflected in the terminal symptom algorithm for restlessness. If the patient is experiencing refractory RLS causing significant sleep disturbance or if benzodiazepines may potentially treat concurrent symptoms (e.g., anxiety), they could be considered. Recommendations for the management of nausea and vomiting place particular emphasis on nonpharmacologic management due to the adverse effects of many of the commonly used agents (30,31). Ondansetron can be constipating. Haloperidol, metoclopramide, and olanzapine are all dopamine antagonists and should not be prescribed together. In addition, they cross the blood-brain barrier, and they can cause extrapyramidal symptoms and exacerbate RLS. Metoclopramide has prokinetic properties and would be first-line treatment for patients with nausea and vomiting due to gastroparesis. Olanzapine has a lower risk of causing extrapyramidal symptoms, but it has a higher risk of causing metabolic side effects, like weight gain and type 2 diabetes. Haloperidol has a higher risk of extrapyramidal symptoms than both metoclopramide and olanzapine. Nonpharmacologic therapies have become a vital part of managing chronic pain. They may be used as standalone therapies or to augment pharmacologic treatments. Medication should not be the sole focus of treatment. The choice of an appropriate initial therapeutic strategy for pain is dependent on the type of pain. Neuropathic pain results from damage to the somatosensory nervous system and is commonly described as burning, stabbing, or shooting. Nociceptive pain results from tissue damage causing stimulation of sensory receptors and may be described as sharp, dull, or cramping. Neuropathic pain responds well to adjuvant therapy. For patients undergoing conservative kidney management, the first-line treatment of neuropathic pain involves calcium channel-α 2δ-ligands, such as gabapentin (32,33). Tramadol and opioid medications are considered second line. In contrast, the first-line pharmacologic approach to nociceptive pain involves analgesics. Opioids are recommended only as the last option, and they should be started at low doses, monitored carefully for adverse effects and overall benefit, and titrated slowly. Five distinct algorithms specific to the end of life were developed for the following symptoms: breathlessness, pain, nausea and vomiting, respiratory secretions, and agitation and restlessness; they can be accessed freely from the online conservative kidney management pathway (3). As a patient’s condition deteriorates, certain nonpharmacologic interventions will become less realistic (e.g., exercise). It is important to ensure that appropriate supports are in place to assist with activities of daily living and that nursing care is available as needed. These end of life algorithms emphasize the importance of anticipatory prescribing and having an alternate route to oral. They also highlight when referral to a specialist palliative care team may be appropriate. Drowsiness may increase as the end of life approaches due to disease progression and/or medications; some patients and families may even prefer increased drowsiness if the patient remains comfortable. Although conservative kidney management is increasingly recognized as an appropriate treatment option for patients unlikely to benefit from dialysis, there is still great variation in the current understanding and acceptance of conservative kidney management as a distinct modality choice (1,2). With this variation comes great differences in clinical practice and standards of care. It is hoped that the recommendations presented here will serve as a starting point for a standardized approach to care that can be refined as evidence for best practice accumulates. Our ongoing evaluation of these recommendations includes patient and family caregiver perspectives and the effect on outcomes, such as overall symptom burden, preservation of physical and cognitive function, satisfaction with care, and QOL. This is an important step toward furthering knowledge and optimizing patient outcomes. The recommendations, however, serve another purpose. By including the philosophy behind each intervention, it is hoped that they will support conversations between care professionals, patients, and families to more clearly elicit goals of care and better understand not only the patient’s symptom burden but also, what matters most to them. Many patients undergoing conservative kidney management present with complex health scenarios, and most recommendations have to be personalized. By explaining the rationale and possible benefits and drawbacks of interventions for CKD and symptoms, patients can become active participants in a shared decision-making process, ensuring that all interventions are aligned appropriately with their values, preferences, and prognosis. This article contains supplemental material online at http://cjasn.asnjournals.org/lookup/suppl/doi:10.2215/CJN.10510917/-/DCSupplemental. This work was supported by funding from Alberta Innovates Health Solutions grant 201400400. The authors would like to acknowledge the contributions of the Kidney Health Strategic Clinical Network and the additional members of the Clinical Guidelines Working Group: Lisa Blacklock, Ruth deBoer, Pat Holmes, Jodi Kerr, Neil Thompson, Julie Yuen (Southern Alberta Renal Program, Alberta Health Services), Amanda Brisebois, Elisa Mori-Torres (University of Alberta), Gloria Finkbeiner, Lana Marchinko, Janice McKenzie, Kari McKnight, Nualla Virga (Northern Alberta Renal Program, Alberta Health Services), and Maureen McCall, (Family Practice, Alberta Medical Association).